Scenario: I’ve got an instrument with two phrases, it’s set to program mode. Phrase 02 is selected in the phrase editor. If I explicitly play phrase 01 using Z01 and then play a ghost note to transpose the phrase. Expected behavior: Renoise continues to play phrase 01 from its current position. Actual behavior: Renoise plays phrase 02. ~~This ghost note technique only prevents sample modulations from being retriggered. It does not perform any form of pitch transposing (at least not in the way you’re expecting here). Edit: Derp. Totally misunderstood original post. Sorry! This ghost note technique only prevents sample modulations from being retriggered. It does not perform any form of pitch transposing (at least not in the way you’re expecting here). The ghost note technique does apply pitch transposition when using phrases… you can clearly see it in the example I provided. It’s really, really useful. 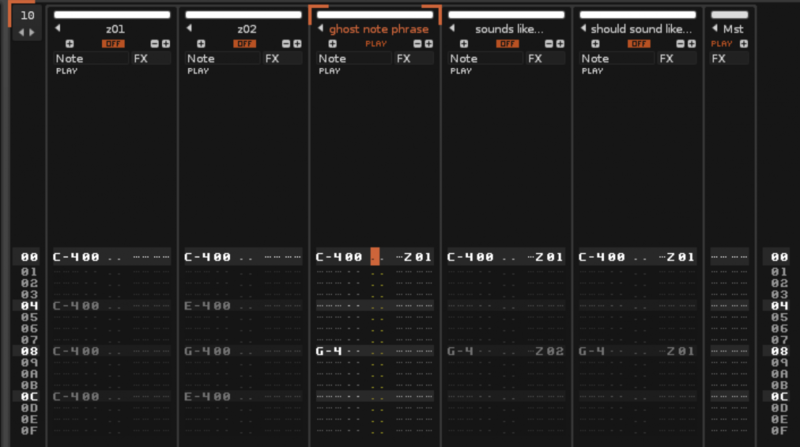 If I have a 16-line phrase, and I play a ghost note at line 8 in the pattern sequencer, then it’ll continue playing the phrase at line 8 – only transposed. Furthermore, the GF technique that you showed does not work with plugins. The ghost note technique I showed does. The example file I attached shows off the ghost note technique applied to phrases. The last track “should sound like” clearly shows the behavior I’m talking about – it continues playing the phrase, only transposed. You’ll notice that I had to explicitly select the phrase to play for the ghost note, because otherwise Renoise uses whichever phrase is selected at the time. I think that makes sense in general, but not when applying a ghost note to an in-progress phrase. you can clearly see it in the example I provided. No worries, I was prepared to be thoroughly embarrassed to learn that it wasn’t actually doing what I thought it was!